← Group Meet Ups or One on Ones? Free games are always appreciated, especially when they’re part of established video game franchises. 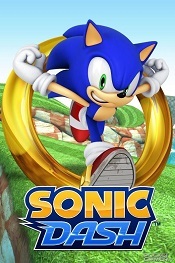 Sonic Dash is a free, infinite runner game available on various smart devices and would be a pleasant addition to most smartphones. The game is pretty simple. You play as Sonic (or one of his friends) and you automatically run forward through various locations from the series. Obstacles and enemies appear as you go along and you can either jump to go over them, or roll so that you can go under or through them. If you hit something, you lose, though you do have a few continues (and can buy more.) Every now and then, you come across a boss battle too, where you have to avoid shots and then tap the screen at just the right time to fight back. While you play, you collect rings and these rings are then used to buy power-ups and to level up the characters. As characters level up, it becomes easier to collect more rings and to run further than last time. Rings can also be used to buy extra characters. The characters are all pretty much the same in terms of gameplay, but unlocking them is still fun. I was sad that Big the Cat was not included, but you’ve got Knuckles, Tails, Amy, Shadow, Silver and the others that you’d expect. Unexpectedly, they once did a special event where you could unlock characters from Angry Birds Epic and another where you could unlock Sanrio characters (like Hello Kitty.) Its a little frustrating that those limited time characters are no longer available. You can also pay to unlock Classic Sonic and a Green Hill Zone area. It might not sound like much, but since you’re not paying for it, it’s definitely worth a play. You’ll find that it is really rather addictive. Whether you like Sonic or not, you’ll probably enjoy it as it’s very accessible. The paid content isn’t really worth it, but it’s a fun game all round. It also looks great and has a lovely soundtrack (there are some annoying sound effects though.) I recommend it.